Due to transparencies, drop shadows, text defaults, and certain effects not imposing correctly in pre-press, we recommend an email proof. All email proofs are setup with artwork files after pre-press has finalize them for printing (In other words, the way you see the proof is how your final product will print). 24hourcolor.com is not responsible for any missing artwork, color/s, or text that doesn't print on final product/s ordered. If you have any further questions about artwork, please contact customer service. Inevitably you have sent a file as blue and received a purple printed product. Unfortunately, this is a common problem in offset printing. Since blue and purple are very close in the CMYK spectrum, it is extremely important to monitor your Magenta build before sending a file to print. As a rule of thumb, the Magenta build should be approximately 30% less than the Cyan build for blue and 30% higher than the Cyan build for purple. Please do not submit files in 400% black because it will cause offsetting. As a current customer you have probably seen this notice on the artwork upload page: "All artwork submitted must include 1/8" bleed and be cropped down to size." Basically, we are requesting you do not send artwork floating in the middle of a large canvas. Your canvas should be the final size of your artwork plus bleed. 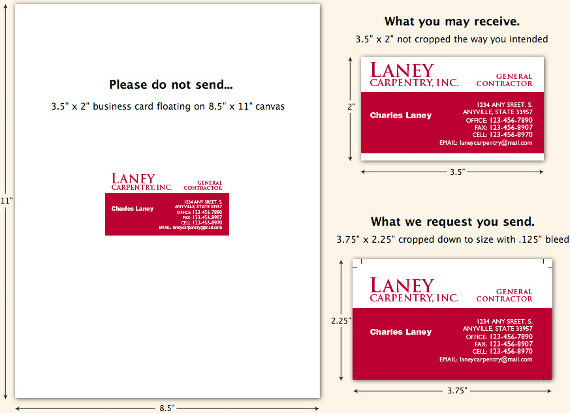 For example, if you are ordering a 3.5x2" business card, your canvas size should be 3.75x2.25". This will accommodate for the 1/8th inch bleed. Following these guidelines takes the guesswork out of prepress and will help ensure that 24hourcolor.com has the correct layout of your artwork. If you have to submit artwork floating on a larger canvas, please order an email proof. Ordering an email proof gives you a final look at layout before it prints. While the addition of a border may be a nice design aesthetic or an easy way to add bleed to a customer supplied file, it can be detrimental to the end result of your print job. 24hourcolor.com highly recommends removing all borders before sending files to print. 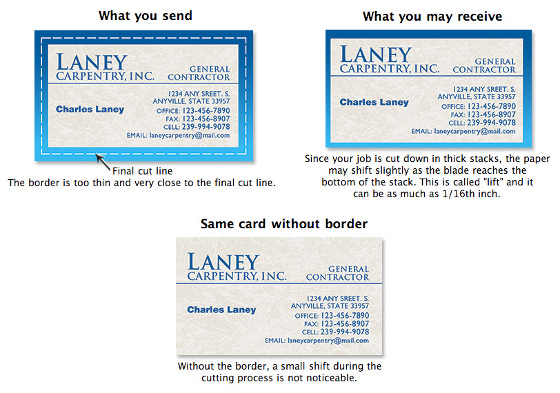 Due to the speed of our cutters and our sheet lay-out, borders can make even the straightest cuts look crooked. Although 24hourcolor.com often trims borders to perfection, the issue can be avoided 100% of the time if borders are removed completely before submitting artwork.